Catnic’s galvanised steel angle bead. It is vital that the design aspirations of architects are met through a selection of quality products. A certain desired building finish is expected from main contractors and their clients, and a quality product can help achieve this. 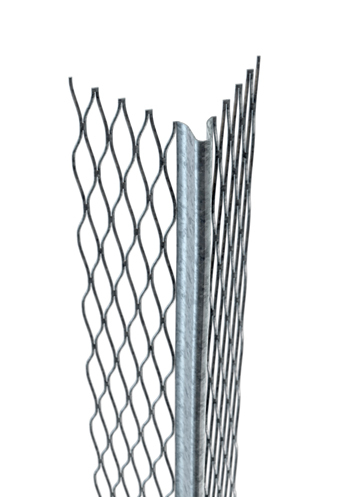 International brand Catnic, a steel mesh and profile manufacturer, is no stranger to delivering in accordance with high expectations. For when a particular product is specified, an architect will always have a reason for that selection, usually based on a known and trusted standard of performance. Where a specification is labelled ‘equal or equivalent to’, a product of comparable performance is acceptable for use – and for the contractor or sub-contractor this should mean also ensuring that any legislative standards are still adhered to. ‘Equal or equivalent to’ is really an invitation for contractors to introduce alternative products that the architect may not have been aware of – but there is often a lack of responsibility to ensure that those products comply with the performance or legislative requirements of the one originally identified. Spec switching is common practice, yet all too often it is based on cost saving and the integrity of the initial specification is lost. Plasterers’ beads are an example of this. When high quality beads such as Catnic’s are specified, any switching most often leads to a product being installed that falls short of the technical capabilities and performance that was expected from the architect’s original criteria. In the Gulf region, in particular, it is especially important to stick to the specification, as there is a serious risk of corrosion with the humid climate. So if a lower quality product is used, it is not likely to live up to expectations. Corrosion can be the result of many different factors. Trowelling wet plaster onto walls and scraping the surface of lesser quality galvanised beads will expose edges, which can become susceptible to moisture – eventually oxidising and inadvertently causing rust that stains the plaster itself. In some of the worst instances, the level of oxidisation can cause the bead to warp and twist away from the wall. Chunks of the plaster can break off in the process, requiring extensive corrective work. In external applications, a galvanised steel bead with a minimum zinc coating of 275 gm per sq m, with exposed faces protected with a PVC (polyvinyl chloride) nose sheathing or epoxy coating can provide the most robust specification option. For example, Catnic’s galvanised beads carry a 0.45-mm gauge, 11 per cent above the British and European standards. They also have a stainless steel profile that is manufactured from 0.44 gauge, 25 per cent above the minimum British and European standard requirements. Products with a lower gauge of zinc offer less protection for the bead and risk damage and corrosion. To reduce this risk, a brand name should be specified, without any ambiguity. The quality and inherent compliance that comes with a reliable manufacturer provides reassurance through the supply chain, installation and the finished building. A CE mark can give further quality assurance to the specifier, while the end-user is reassured that the bead meets all the requirements of the latest standards. The Construction Products Regulation (EU) 305/2011 demands that profiles, beads and lath are manufactured in accordance with EN 13658 – 1 and 2. A CE marked product must be supported by documentation to prove that it has independently been tested to certain requirements. Main contractors and architects can identify Catnic’s own products by simply checking for the stamped brand that is visible on all its components, alongside the required CE mark on the product packaging. Construction in the Gulf region is expected to boom, with the region named amongst the most expensive markets for construction in 2014. With this in mind, it is important to focus on the first stages of the construction process. The ultimate goal is for a fully compliant, quality finished building that performs to the expected standards.